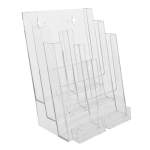 The Wall Mount Single Pocket Half-Page Brochure Holder with Business Card Holder can hold material up to 6” wide and comes complete with a practical card holder attached. 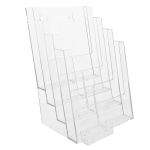 Combining two different sizes of information in one holder elevates this to a custom display, giving customers a choice of information to take. 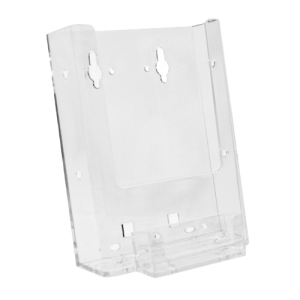 Crystal clear, strong injection molding offers strength, clarity and outstanding value. Our many attachments make this the most versatile brochure holder available. The Single Pocket Half-Page Brochure and Business Card Holder can be used for literature up to 6'' wide and standard business cards, gift cards or coupon cards. Easily adapts to slat wall, grid wire, peg board, counter top and smooth glass-like surfaces. Clip two or more together with Couple Me Clips. Double sided tape available. Professional environments, convenience stores, automotive repair facilities, insurance agencies, service industry.